Ease your way down the highway with the nüvi 465LMT – our first nüvi designed specifically for the over-the-road trucking industry. Featuring specialised routing options throughout Australia and New Zealand and truck friendly points of interest, this full-featured navigator was made for life on the road. The nüvi 465LMT also lets you create custom vehicle profiles tailored to what you’re driving and what you’re hauling. It’s convenience created with truckers in mind. Featuring a 4.3” high-resolution touchscreen display, the nüvi 465LMT provides users with a wealth of information in great detail. Preloaded with detailed, street-level maps of Australia and New Zealand, the nüvi 465LMT speaks street names so drivers will receive turn-by-turn, voice-prompted directions, such as “turn right on Main Street.” The nüvi 465LMT also comes standard with lane assist, which guides users to the right lane at the right time – especially helpful when navigating complex highway interchanges. With detailed maps providing turn-by-turn directions that call out streets by name, the nüvi 465LMT provides specialised routing to support truck-related restrictions (customisable by height, weight, length, width and hazardous materials). Simply enter dimensions and if your truck is carrying hazardous materials and nüvi 465T guides you according to your requirements. You can even enter multiple-point routing so that you can take a more efficient route between multiple stops along your trip. Know what lies in your path with the nüvi 465LMT . It displays warning information of upcoming road conditions to make drivers aware of possible hazards along selected routes such as sharp curves and steep grades. You’ll also get lateral wind warnings and notification when the road narrows. It’s the safe way to travel down the highway. The nuvi 465LMT can be configured to avoid certain types of maneuvers or objects, such as U-Turns, or tolls. By default, U-Turn and Traffic avoidances are enabled. Checking the box next to any of the available avoidances causes the nuvi to route around selected avoidances. For example, if Toll Roads is checked, the 465LMT will calculate routes that avoid tolls, even if it will result in a longer route. It is compatitable with traffic receiver GTM 25 notifying you for traffic accidents and construction zones that lie ahead on your route. For hands-free calling, nüvi 465LMT integrates Bluetooth® wireless technology with a built-in microphone and speaker. 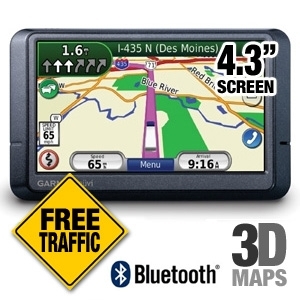 Just pair it with your compatible Bluetooth phone and talk hands-free through the 465LMT while staying focused on the road. Simply dial numbers with nüvi's touchscreen keypad to make a call. To answer calls, just tap the screen and speak into its built-in microphone. Enjoy convenient one-touch dialing for contacts and points of interest. Whenever the nuvi 465LMT is powered on, a warning message is displayed that lets you know which mode the GPS is currently set to: Truck or Automobile. Agree to use the currently selected vehicle type, or switch to Truck/Automobile mode. Before you can use the nuvi 465LMT in Truck Mode, you need to configure at least one Truck Profile. You can create and save multiple profiles, but you'll need at least one so that the nuvi 465LMT will know what type of height, weight, and load restrictions to take into account when figuring out which roads to use. You are automatically prompted to setup a Truck Profile the first time you try to use the nuvi 465LMT in Truck Mode. Truck Type can be set to either "Over the Road", or "Delivery". Truck Profile, Page 1. Scroll down to view the additional profile fields. Once all the required profile settings have been entered, tap Save to save the profile and make it available for use. Review the Truck Profile settings. Tap Change if you need to change any of the settings, or OK to save it. Assign the saved truck profile a name that makes sense to you (this is more important if you plan on using multiple profiles). Once the Profile has been saved, it can be selected as the active profile when operating in Truck Mode. Tap the saved Profile to use it. The nuvi 465LMT knows when trucks are prohibited on certain roads or highways, and alerts drivers if they're on a road they shouldn't be. When driving on a road that prohibits trucks, a large, red box appears over the map alerting the driver that trucks are not allowed on the road ahead, and to take the nearest exit. If you are navigating to a destination, the nuvi 465LMT automatically re-calculates a new route using the next exit as soon as you close the alert window. 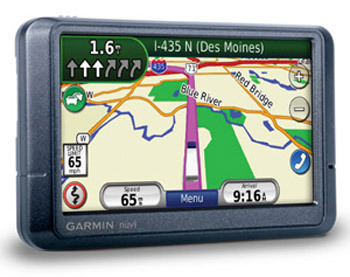 Garmin's map screen, shown above, is alerting the driver that there is a height restriction approaching. Specifically, in 8.9 miles there will be an overpass or bridge that is isn't tall enough to accommodate the truck's height (based on the height entered in the Truck Profile). Additional alerts are also displayed in the lower-left corner. Tapping the alert icon displays more detailed information about the alert. When approaching a roadway that isn't tall enough for your vehicle's specific height, the above warning is automatically displayed. Less severe caution alerts are displayed in the lower-left corner of the map screen, as shown above. Depending on the weight, length, and number of axles your truck has, the nuvi 465LMT may display caution warnings when approaching sharp curves.